Situated in the Vera district of heart Tbilisi City,from our balcony you can see all Tbilisi . the most ancient bars ,restaurant and cafe shop at tbilisi around you by foot Herrmas hostel is 5 minuets by foot from Rustaveli metro station , 15 minutes by foot from freedom square , 700 m from Tbilisi Zoo, 3 minutes by foot from vera park Popular points of interest around the property include Tbilisi Opera and Ballet Theatre and Rustaveli Theatre. The accommodation offers a 24-hour front desk and valet parking for guests. Freedom Square is 2.3 km from Herrmas hostel, while Tbilisi Concert Hall is 200 m away. Tbilisi International Airport is 16 km from the property. All units at the hostel are fitted with a seating area and a flat-screen TV. 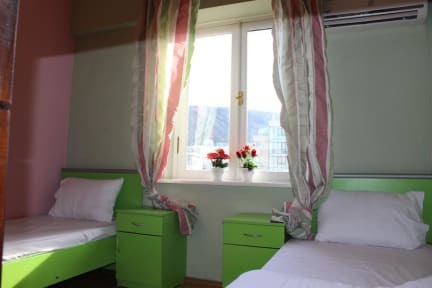 Featuring a shared bathroom with a bath and free toiletries, rooms at Herrmas hostel also provide guests with free WiFi. 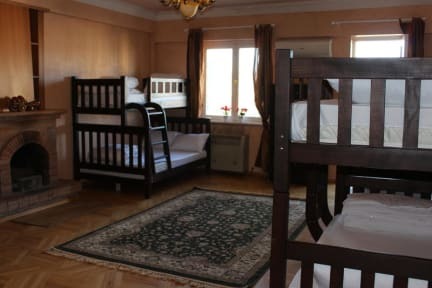 All guest rooms at the accommodation include air conditioning and a wardrobe. A continental breakfast is served every morning at the property.